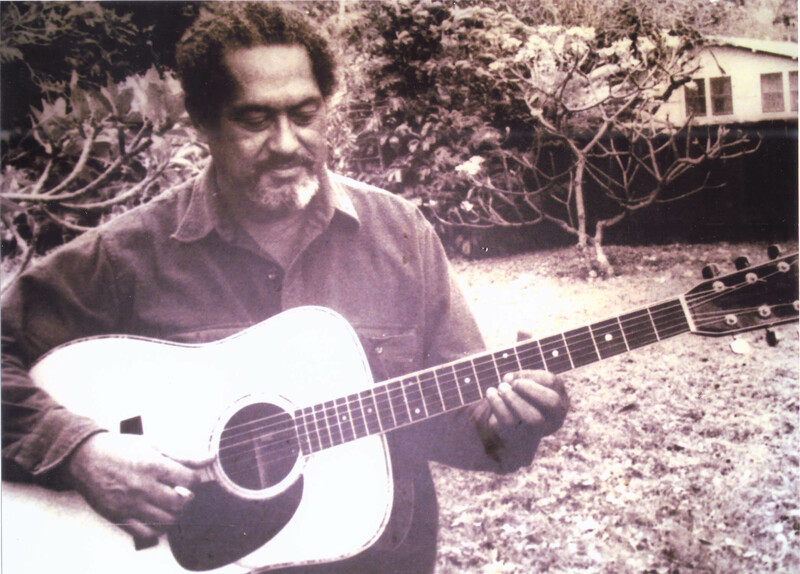 The late Gabby Pahinui was one of the great 20th century masters of Hawaiian vocal, slack key and steel guitar music–a true working class hero. Gabby was a brilliant self-taught musician whose musical influences were the big band and jazz music brought to Hawai“i to entertain the tourists at the Waikiki hotels and spilling over into the surrounding streets and bars in the district where he grew up and the traditional Hawaiian music favored by his native community. His ability to master any stringed instrument coupled with his bright falsetto that became raspy with age and guttural deep tones made him a unique fixture on the Hawaiian music scene. Gabby’s was the raw, plaintive, earthy and powerful “under-the-stars” backyard music of Hawai‘i. His talent, charisma, and good humor endeared him to millions, as did the humility and human kindness he demonstrated throughout his life. Gabby is the maestro of South Seas music with a sound and style that uniquely combined his diverse musical influences and blurred and challenged the social and racial barriers of the time, he ushered in the Hawaiian Renaissance, a renewed interest in traditional forms of music and a whole new era of popular culture. Still striking a universal chord in the hearts and minds of people who hear it, his music provides a link between generations. His career had its ups and downs and can be separated into three distinct phases: club performer in the early years, recording and concert artist in the middle years and in the years leading up to his death, primary recording force–though he coupled recordings with key concert appearances. “Gabby Pops” Pahinui, passed away on the golf course October 13, 1980. His young days were spent helping to support the family and attending Pohukaina School until the fifth grade after that he had to drop out to work. Gabby liked music and every chance he got, he listened to the musicians in the neighborhood playing at luaus and the guys playing right in their yard next door, one guy on the guitar and the other on the squeeze box, or he took the streetcar to Kapiolani Park with his dad and mom to see Lena Machado, Liz Alohakea, and the Royal Hawaiian Band. To help his impoverished family he shined shoes for a dime in a Filipino plantation camp and sold newspapers in front of the Kewalo Inn at Kewalo Basin. It was the best place to eat so musicians like Tommy Castro, Knick-Knack, Steppy Rego from the Royal Hawaiian Hotel would come in to eat and play music upstairs in the cocktail lounge. Gabby taught himself to play bass fiddle at the age of 10. He spent his time listening to recordings of big bands and small combos that included Artie Shaw, Tommy Dorsey, Jimmey Lundsford, Andy Kirk, Glenn Miller, Count Basie, Woody Herman, Stan Kenton, and Duke Ellington. Although he didn’t understand written music he played along by ear on a borrowed guitar and tried all kinds of music especially progressive jazz. Jazz became his first love. He often spent his time playing along with the songs of Benny Goodman, Lionel Hampton, and Django Rheinhardt on a borrowed guitar. The first guitar player he really liked was the be-bop sound of Charlie Christian, who he listened to when his family was not around. When they were, they preferred the Kalima Serenaders. So he wouldn’t have to borrow anymore, Gabby’s stepmother bought him his first guitar for about $5 or $10, which was a lot of money in those days. Most of the other people he played with wanted to play Hawaiian music, so he began playing Hawaiian music when he was 12 to earn extra money for cigarettes. And really got to like it when he heard Sol Ho‘opi‘i, Eddie Bush, the Biltmore Trio, and then Andy Iona who played both Hawaiian and what was known as hapa-haole numbers. In those days everybody played with everybody so he learned a lot from the old-timers through experience. Playing with them in the bars, drinking, and going to jail with them. First playing in a bar when he was 13 years old. Gabby got his first real start in music during the 30’s when he landed a gig as a back-up guitarist for a musician named Charley “Tiny” Brown who played the steel guitar. Gabby stayed with him and began to learn steel. He listened to Sol Ho‘opi‘i, Puni Kaulia, for bell work, David Keli‘i, Tommy Castro, Jules Ahsee and also Jacob Keli‘ikoa. His first professional gig was in 1933 at the Red Skelton Club. One night when the bass player didn’t show up, they asked him to play for him. The going rate was $12 a week. He started playing regularly at the old Smith Cafe in Waikiki in 1937. Playing backup for Tiny and many other noted musicians of the day, he quickly built a reputation as a sound musician. It was through these experiences that he mastered the steel guitar. Before jukeboxes live music was featured in all the bars so most of the musicians he played back up for in those days gigged only at the various bars throughout town. Through the years he played in over 200 clubs in Honolulu. He first met Guitarist, Andy Cummings at Chock See’s by the sea near Ala Wai Bridge where all the Yacht Club owners went. Musicians set up along the streets and played for kitty and split the money up at the end of the night. In the 1930’s Gabby joined Andy Cummings and the Hawaiian Serenaders, Hawai‘i’s 1940s Super Group to play at Felix’s Fountain Garden. Andy’s flair for swing permeated his arrangements and compositions with style and grace. He had a knack for composing and arranging songs that featured catchy lyrics wrapped in a memorable melody. His flair for producing a hip tune for the young crowd, in addition to performing traditional classics for the elders, attracted fans of all ages. In addition to Andy Cummings on guitar and lead vocals, the group featured Ralph Alapa’i on ‘ukulele, Joe Diamond on bass, David Nalu on steel guitar, & Gabby Pahinui straight guitar. The group recorded “Kaimana Hila” and Gabby played slack key when they performed Hi‘ilawe. When David Nalu the steel guitar player died Gabby began to play steel guitar for the group and continued to until 1947 recording on Bell Records. In those days the group would do private parties and go around serenading people at the Halekulani residential area and in Kahala so he played an acoustic steel. Though a master of the steel guitar, Gabby is most known for his mastery of the slack-key guitar. 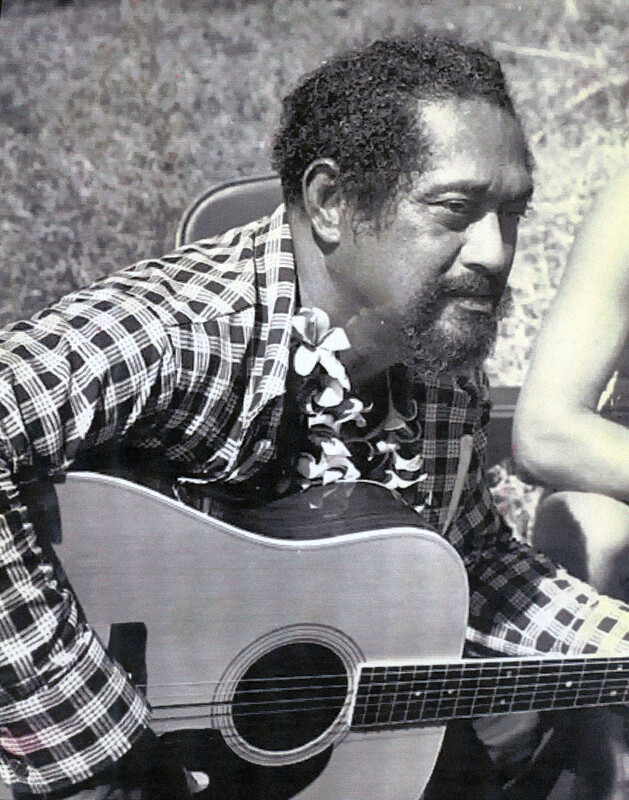 Gabby learned slack-key from Herman Keawe whom Gabby acknowledges as being “the greatest slack-key player of all time.” Herman, like Gabby, lived in the Kaka’ako area. In 1938, at age 16 Gabby met Emily while playing volleyball, fell in love and had their first child. They got married a year later. Together they had 13 children though three were lost to miscarriages. Times were tough so five guitars were sold to get the babies out of the hospital. They family was moved here and there because he could not pay the rent, though he prided himself that he never asked for welfare to help. Sometimes stew was a luau. His step mother died when he was 22 so she never got to see that he finally made it in music. All of Gabby’s musician friends came to his house after playing the town to eat, drink and play music and then sleep over. All the performers would end up there –Mahi Beamer, Sonny Chillingsworth, Eddie Kamae, Don Ho, and Kui Lee. As he matured, Gabby played professionally with many of the great bands and all of the great musicians of the time including such legends as Lena Machado, Alvin Isaacs, Barney Isaacs, Ray Kinney and George Kainapau among others. He also appeared on Hawai‘i Calls, a popular international radio show that began in the 1930s. In 1946, Gabby made his first recording, “Hi‘ilawe,” for the Bell Records label. This was the first recording of a Hawaiian song with slack-key guitar. The following year came “Hula Medley,” the first recording of a slack-key guitar instrumental. During this period he made two other influential sides for Bell, the vocal “Wai O Ke Aniani” and the instrumental “Key Koalu” (a misspelling of “Ki Ho‘alu,” the Hawaiian term for “slack key”), plus another version of “Hi‘ilawe” for Aloha Records. His music career reads typical of many great Hawaiian musicians. It took him throughout the islands and the U.S. mainland as well as many bars, lounges, lu‘au’s and other concert venues. In the 1950’s, he worked with Eddie Spencer at the old Queen’s Surf. Throughout the 50’s and 60’s two notable career highlights included playing on the popular International radio show Hawai‘i Calls. Gabby was also an original member of the Sons of Hawai‘i a name given to the group by a Waimanalo neighbor, Aunty Mabel Macabe which helped to jumpstart the Hawaiian Renaissance. He recorded Hi‘ilawe again in 1995 and it quickly became his signature song. Despite success in music, the Pahinui’s life was one of struggle. Rent was hard to pay, and with 13 mouths to feed food was something not easily put on the table. 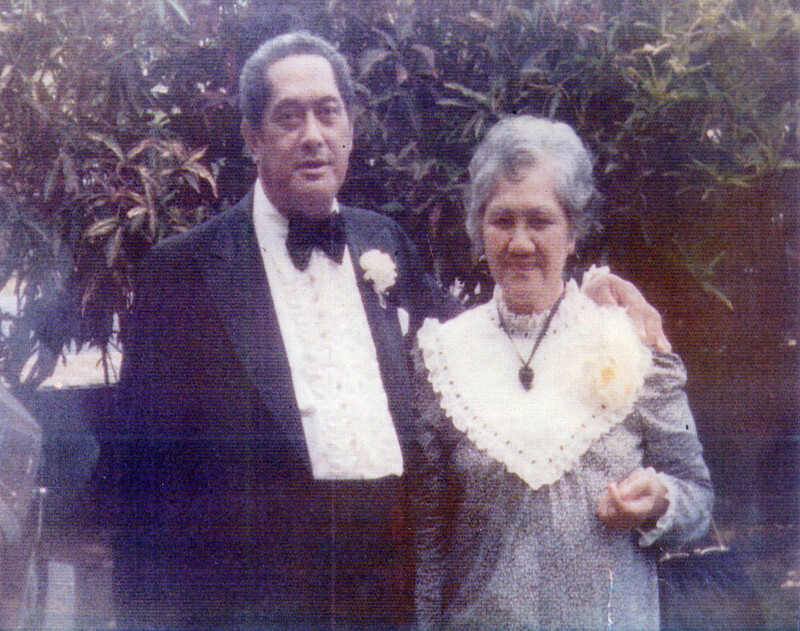 During the 50’s Gabby, Emily and the children moved to the famous Pahinui home in Waimanalo. The Waimanalo home become a popular second home to many noted musicians. Weekend’s at the Pahinui home were a continuous jam session as the Pahinui’s hosted dozens of musicians who would come by to jam with “the Master.” Pots of rice and beef stew would always be on the stove in case guests came by to play music. Pahinui was a sly, cheerful fellow who had the knack of eliciting instant empathy. His long battle with alcohol made him seem more like a regular fellow, although he was anything but. After the breakup of the Whiskeyhill Singers in 1961 Dave Guard (of the Kingston Trio) returned to Hawai‘i. Always a folk music eclectic, Guard attempted to publicize the slack-key sounds of Hawaiian folk guitar. Guard worked closely in Honolulu with slack-key guitar icon Gabby Pahinui to record and produce Pure Gabby, an album of classic Hawaiian melodies played with slack key tunings. Guard tried to interest major record companies with Pure Gabby, but met with little interest, and Guard shelved the project. In 1978, ten years after his return from Australia, at the urging of Singer colleague Cyrus Faryar who had heard Guard’s Pure Gabby tapes, Guard contacted Hula Records of Honolulu about Pure Gabby, who quickly agreed to take the recordings and distribute the album. Gabby worked as part of the City and County road crew doing pick and shovel work. He worked for the road crew for 14 years till a work accident ended his career The 1970’s saw the Hawaiian Renaissance, the cultural reawakening of the Hawaiian people which sparked renewed interest in all things Hawaiian. Gabby was right at the forefront of the movement. Scholars of Hawaiian music cite him as a major influence. Yet rather than seek commercial success, he played music out of pure love. Instead of compromising his music, he supported his family by driving a City & County of Honolulu refuse truck for much of his life, until he had an accident on the job. In the last few years of his life he taught Hawaiian slack key guitar to the youngsters of the community for the County’s Department of Parks and Recreation. Although widespread acclaim eluded Gabby Pahinui till late in his life. It was in the 1970’s that he was “discovered” when the album called brown “Gabby” was released. Other albums followed. Gabby became a figurehead, an icon, a pied piper not to his generation but to his childrens’. He paved the wave for many musicians to come. He became known as “Pops”. During the 70’s Gabby recorded 4 albums on the Panini Records label. By the 1970’s Gabby’s health was failing. A life long drinking habit, mixed with his work accident had left his body wasted and in pain. In 1978, he was recognized by the state House of Representatives for being the person most responsible for preserving many of the Island’s sons–an honor he received while clad in overalls, work shirt and zori (a Japanese-style flat thonged sandal made of rubber–popular Everyman garb in the Islands). 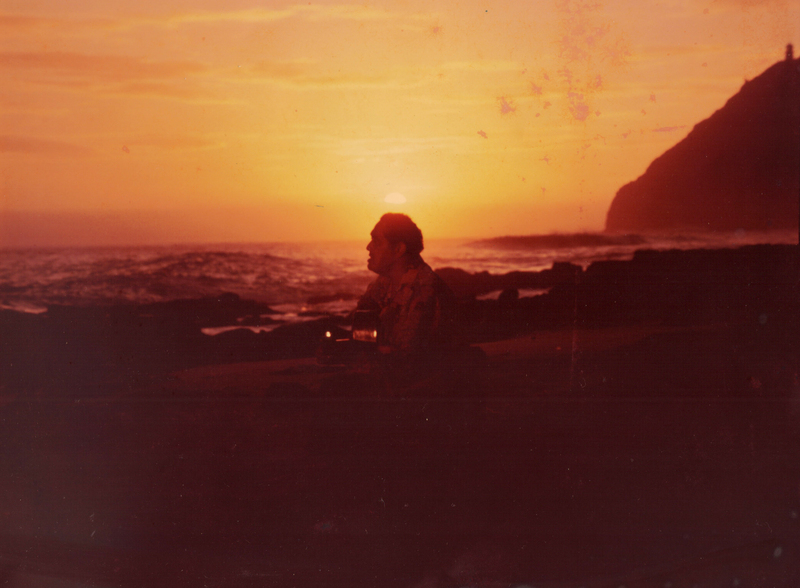 In 1979, he was one of nine persons named “Living Treasures of Hawaii” by the 67th Legislative Assembly of the Honpa Hongwanji (Buddist) Mission in Hawaii. On May 4, 1980, he won Hawaiian music industry’s coveted Na Hoku Hanohano Award for his “Slack Key Medley” off of his “Pure Gabby” album. While playing a round of golf with friends, Charles Philip “Gabby Pops” Pahinui, a Hawaiian Legend, passed away from a massive stroke at 2:27pm on October 13, 1980 and the age of 59. His music lives on.